I began Canvas of Cancer because I wanted to do something worth while with my face painting and body painting. Last year I branched into body painting and have found a love for it, it took my face painting to the next level. I wanted to make a difference, but do more than just donate a few hours of face painting for a fundraiser or donate a birthday party for a raffle. I don't remember how the idea came to me to body paint on cancer survivors, but my life is forever altered because of that idea. It's been a difficult, rewarding and wonderful experience as I've tried to get together body paint artists, models who have survived cancer, and photographers to donate their time and talents to this cause. From getting dogs into a studio to photograph with a dog loving boy, from painting in a hair salon as our backdrop, and soliciting every which way I could think of to find cancer survivors who were willing to take a leap of faith; this experience has been one-of-a-kind. I love every single one of these models. Not only for taking the time to let us paint them, but for being fighters. For staying positive, for their constant smiles and for their gift of living. All proceeds for the sale of this book go to the American Childhood Cancer Organization of Utah and the Cancer Wellness House. 16 Cancer survivors. 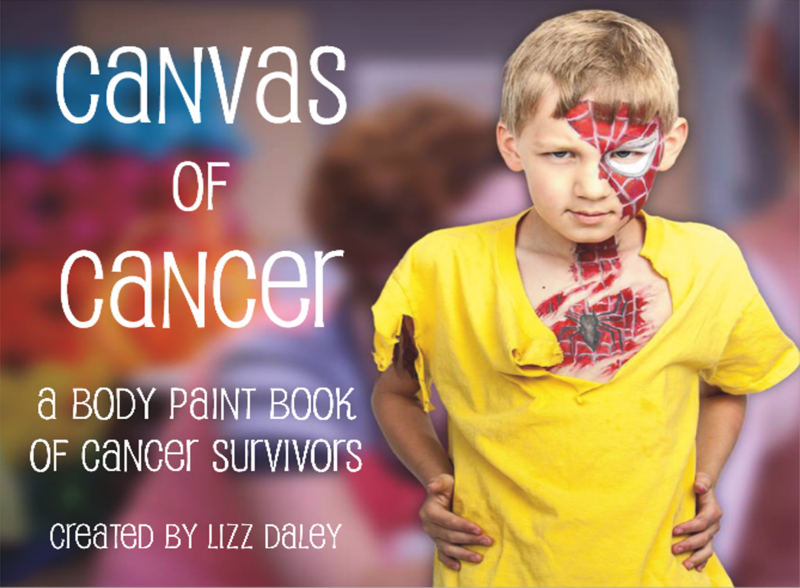 Each spread features a photo of the model in all their body paint glory and then the story of the fight with cancer. All proceeds go to the Cancer Wellness House and the American Childhood Cancer Association of Utah. you can find the links below.